Heather Wardell, Women's Fiction: April 25, 2008: Branch out, baby! April 25, 2008: Branch out, baby! b) a small skein of recycled silk. This is apparently spun from snippets of sari fabric, and it's stunningly beautiful. 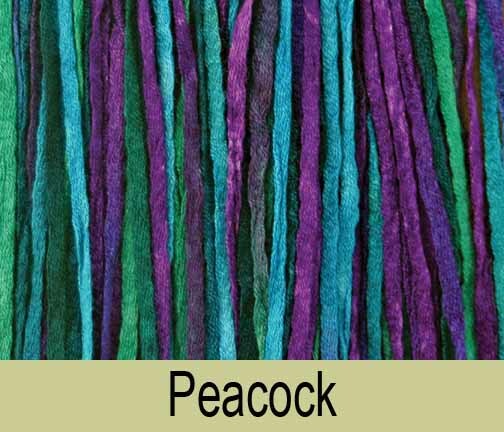 Mine is similar to the blue shade but with more purples and greens. Absolutely no clue what it'll become, but it refused to stay at the show and insisted on coming home with me. Cannot argue with yarn! c) 16 balls of Bernat Black Lites, a beautiful black yarn. Mine is like the picture but with blue strands through it. It was $0.97 a ball and I sort of went crazy. I also bought a pattern book for $0.97 and this yarn will become a knit cardigan once the first cardigan is finished. Sometime in 2098, I'm thinking. d) Five balls of Bernat Haven in a soft green. This is going to be a snuggly little wrap. Why am I posting all of this? Besides the fact that yarn is purty? Because I have developed an unfortunate tendency to stick to the patterns in crafting, especially crocheting. I don't seem to just pick up a hook and some yarn and just play. And just playing is probably the best thing I can do, at least sometimes. Favourite Part: driving along to/from the show and having bits and pieces of the book form themselves in my head - 'weekends' don't really exist when a book's trying to figure itself out! Exercise: 45 minutes elliptical - which is great, except it was SUPPOSED to be 30 minutes and 30 minutes of weights, but I forgot and just did the elliptical. Oh well.